The freebies include Wi-Fi parking and continental breakfast at the recently renovated Days Inn Fairmont. Updated in 2011 all 46 rooms at the two-story exterior-corridor Days Inn offer free Wi-Fi premium cable TV (HBO included) coffeemakers microwaves compact refrigerators and data ports. Some rooms are non-smoking. Wake up and fuel up at each morning's complimentary continental breakfast and head to the lobby any time of day for a free coffee refill. The front desk is staffed around the clock a bonus for guests arriving late. Parking is free. 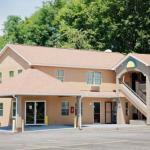 The Days Inn is on Interstate 79 a quarter-mile from the nearest shopping mall and cinema. It's 20 minutes from Morgantown and 20 miles from West Virginia University. Marion County Industrial Park and Pepsi Bottling Group are both less than two miles away. The FBI is eight miles away and NASA is one mile. North Central West Virginia Airport is less than nine miles from the hotel.